On special weekends, we have sign language awareness nights at The Great Passion Play. If you or a loved one is hearing impaired, we will have an interpreter in front of a section of the audience so you can see The Greatest Story Ever Told in a way you’ve never experienced it before at The Great Passion Play in Eureka Springs, Arkansas. 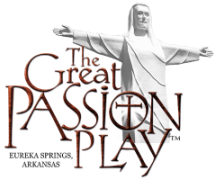 Visit our website at www.GreatPassionPlay.org. Also, visit all of the other events on the grounds: the Holy Land (special tour at 1:00pm with an interpreter for the deaf), the Bible Museum, the Sacred Arts Museum, David the Shepherd, and the Parables of the Potter. Sign Language will help make the Scriptures in the Bible come alive to you at The Great Passion Play. Learn more about future deaf awareness weekends.